In this issue we look back at last Summers Heritage Open day, and forward to some new developments in the restoration of the church. I'm also very grateful to Fr Richard for the fascinating review of other medieval churches now in use by the Roman Catholic church, produced here as a 'Special Supplement', plus the second in our 'Friends of the Friends' series. Last September the national Heritage Open Day had the theme of 'Young people'. To mark this, Friends of St Mary's got together with the Young Archaeologists Club and Cricklade Museum to host an investigation of the gravestones and commemorative monuments in and around the church. The day was a great success, and many thanks are due to Katy Whitaker from the YAC, and John Samways from Cricklade museum for bringing it all together. 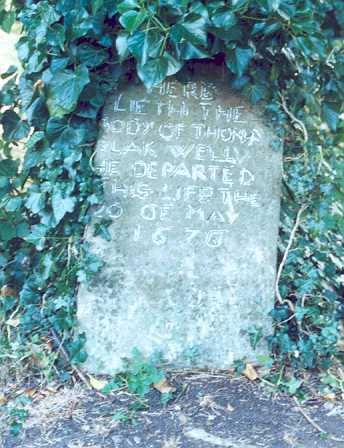 No trace of this memorial, or another memorial to William Leetch (d. 1727) recorded by Philips on ‘a flat stone in the body of the church’ now remain. As well as raising money and organising events, the Friends of St Mary's is there to celebrate the contribution made to the upkeep of the church over the last twenty or so years by many individuals. Seymour and Louise Aitken have, over the years hosted many Friends events at their home and gardens in Cricklade High Street, a stone’s throw from the church. Here Seymour recalls the last twenty years involvement with St Mary’s. “On moving to Cricklade in April 1980, we soon became aware of the beautiful little Church of St. Mary's across the street and the sad condition of its fabric, also the desire of St. Sampson' s PCC to find an alternative use for it, although occasional services were still being held there. We took it upon ourselves to sweep up plaster that had fallen from the roof and to polish brasses, and at festivals, such as Christmas, my family decorated the church. There was a developing interest in St. Mary's from the Catholic congregation based in the former Baptist Chapel in Calcutt Street when they became faced with a repair bill of some thousands of pounds. At about the same time the Cricklade Historical Society and Town Council recognised that building as a potential site for a new museum in place of the cramped location in the old Town Weighbridge office. Next to the chapel was a small derelict site which could be sold, thus potentially benefiting the Town, the Historical Society and the Roman Catholic congregation. There was much discussion but no action. During the autumn of 1982 the Bishop of Bristol, accompanied by the Archbishop of Bordeaux, expressed an interest in visiting Malmesbury Abbey and St. Mary's in Cricklade. The Vicar, the Rev. Ken Withington, was unable to welcome this delegation and asked me to do so. My wife was at a meeting in London that day, so I spent the morning sweeping the floors and benches in the church, polishing brasses and scraping moss from the flags between the gate and the porch. In the afternoon I settled down with Larousse to mug up the architectural terms that would enable me to give the Archbishop a guided tour in French. He arrived in gathering gloom around 16.00, looking bemused as he walked up the path alone. The Bishop, his attendants and the Archbishop's retinue soon appeared, but were either exhausted or beyond communication after spending the afternoon en tour. Having quickly accomplished my description of the reason for the church' s dilapidation -blaming Concorde seemed a matter of mutual Anglo-French concern - I addressed the gathering of about 20 people, welcoming them and making a presentation to the Archbishop of a small print of the Norman cross. When this was greeted with polite applause I got carried away: I presented the church key as well. In the best tradition of delegation he handed it to Father Eamon McGlinchey. That evening it was placed on the altar at a service in Prior Park's chapel, and the uncertainty of St. Mary's future was resolved. The focus of fundraising at the moment for the Friends is on grant applications. At present the steering committee is working through the process of registration with ENTRUST, a regulatory body set up by the government to administer the distribution of funds raised from a special tax imposed on landfill operators. Registration as an ‘environmental body’ will allow us to apply for grants from this source. The funds available are considerable – in the tens of thousands of pounds range – and our objectives fit well with the sort of work that ENTRUST has funded in the past, the committee is hopeful that the long process of registration will be well worth it. The next meeting of the Friends steering committee will in fact be an Extraordinary General Meeting, open to all members on the 11th March, at St Mary’s church. You should all have received a letter from Bernadette explaining the need for this – we have to amend our constitution slightly to clarify our not for profit status. This is a requirement of ENTRUST registration (see above), and hopefully is a simple change that will command support from all of us. Please do use the voting forms included with the letter to indicate your preference. Our main fundraising event for this year will be held to coincide with the Cricklade Festival (14th to 22nd June). We have provisional plans for an evening event on 20th June, to follow on from the success of last years summer evening concert. We’ll need help with the planning and organisation of this, so if you’ve been hesitant about helping out before now is the time to step forward! Both events need your support! http://welcome.to/friendsofstmarys. Follow the link in the site ‘Table of Contents’ to ‘Church Furnishings’. This year is the 1400th Anniversary of the meeting of St Augustine of Canterbury with the Celtic Bishops in 603. One of the believed sites for this meeting is of course at Latton/Down Ampney and the tradition influenced the choice of the patron for the Catholic Church in Cricklade from 1955-1983 (The present Museum). I am arranging for a Solemn Mass to be celebrated at St Mary's at 7pm on Tuesday 27th May (Feast of St Augustine of Canterbury) to commemorate the event. The preacher will be Rev Dom Austin Gurr O.S.B. Parish Priest of St Gregory's Parish, Stratford-on-Avon. He is a keen Church historian and a member of the Benedictine Community of Douai Abbey. I am hoping that we can arrange a visit to the site of St Augustine's Oak and Lertoll's Well during the afternoon of that day. Now that the Organ has left the North Chapel we could call this area St Augustine's Chapel and perhaps consider commissioning a stained glass portrait of him for the east lancet window. The window could both commemorate the historic meeting and celebrate our former church. An application has been made to the HCC for a faculty to carry out the work on the arch taht leads into the North chapel. We are hoping to be able to remove the wooden support. The meeting is on Thursday 13th March, and full details of what we propose are published in the Church porch. Now that the Town Council has assumed responsibility for the care of the churchyard it is drawing up a scheme to carry out major tree surgery. There is also a plan for a small sub-committee formed made up of members of the Town Council's Community and Leisure Committee, a rep from St Mary's and John Hickman the Churchwarden of St Sampson's. I have invited Morton Outram to represent St Mary's on this committee and he has kindly agreed. Friends of St Mary's Church Newsletter - Special Supplement - St Mary's Cricklade - so its not unique! - so it is not unique after all! It was a very special occasion when the ancient church of St James the Great at Postlip was re-opened for Catholic worship in 1891. The building was constructed during the reign of King Stephen as a chapel-of-ease to the great Benedictine Abbey at Winchcombe. It fell into disuse at the Dissolution and although there is evidence for a seventeenth century restoration it is most likely that it was never used for Anglican worship. At the time of the Postlip estate being acquired by Mr and Mrs Stuart Foster the chapel had been used as a sheep pen for many years and much of the roof was missing. Even though the location of the chapel is very isolated the re-hallowing certainly caused something of a stir. Hill in Gloucestershire, is virtually forgotten. Mass is celebrated there monthly during the summer and on a couple of occasions we have taken groups of parishioners from Fairford there on pilgrimage. During the late 1980’s/1990’s I formed a group of Friends, which flourished for some years. As a result of this interest the church was restored. Sadly there is still no obvious pastoral role for the building and some would argue that this little Norman chapel would make an ideal candidate for vesting in the care of the Historic Chapels’ Trust. What of the other churches that Cardinal Manning spoke of? The story of St Etheldreda’s Church in Ely Place, London, is known to many of you. It is surely one of the best-loved churches in central London with a flourishing weekday ministry conducted by Fr Kit Cunningham and other members of the Rosminian Order. Having been carefully restored after wartime bombing, it still offers an atmospheric liturgical environment brought alive by excellent music. St Etheldreda’s has had a complex history, having been the chapel of the Bishop of Ely, both Catholic and Anglican, until 1772 and finally being leased to Welsh Episcopalians before it was purchased for use as a Catholic Church in March 1874 at a cost of £5,000. The church in Northampton, spoken of by Cardinal Manning, was actually dedicated to St John the Baptist and St John the Evangelist rather than St Thomas. It was one of the few remaining medieval buildings in the Borough. It was built in the twelfth century as a hospital to care for pilgrims and the sick. During the reign of Henry II (1154-1189) a Royal Charter was granted to the master and his brethren who tended travellers. The hospital would have had a similar role to the Hospitals of St John in Cricklade and Lechlade. During the Reformation the property passed to the king but eventually in 1872 the site was sold to the Midland Railway Company. Five years later Dr Amherst, the Bishop of Northampton, bought the chapel and domicile for £2,500 and eventually it was opened on 19th August 1882 by Cardinal Manning. By this action Dr Amherst saved the remaining medieval building and preserved it for religious use. In more recent years the floor of the medieval domicile was removed to make a larger church and the old chapel was retained as a Lady Chapel. This was followed by a programme of restoration work, which was completed in July 1969, at an approximate cost of £17,000. buildings. We must prioritise our pastoral need”. In the event the church was closed and disposed of and, as Fr Payne later wrote in reply to my letter, “the lack of money available was the least significant reason for the decision taken”. One cannot help noting the difference in attitude between that of our forefathers who delighted in reconciling medieval places to Catholic usage and contemporary Catholic leaders who are prepared to make the tough decision to dispose of them! Gavin Stamp, the architectural historian, summed this up quite bluntly when he said at the time: “The Roman Catholic Church has no mechanism for looking after redundant churches, and they are just left to rot. It has an atrocious record in this field.” Mr Victor Hatley, a Northampton local historian, added: “It is deplorable that such an important building is allowed to pass out of religious hands without some provision for its future”. to found Bartestree Convent which is situated some distance away but, in the same year, he died and was buried in the Longworth Chapel. Eventually it was decided to rebuild the Longworth Chapel at Bartestree Convent and this was done in 1869/70. The result has been described as ‘not an identical copy of the medieval building but a Victorian reinterpretation which used much of the original material’. The architects Edward Welby Pugin and Benjamin Bucknall have been involved with the nineteenth century building work at Bartestree. The chapel has several Perpendicular windows and a fifteenth century doorway. Inside the chapel there is a memorial brass, in memory of Robert Biddulph Phillipps who died in 1864, which records details of the story. ‘He restored this ancient domestic chapel and built the adjoining presbytery, with the wish and intention that here the Holy Sacrifice should again be offered in perpetuity for the living and the dead. All you who come within these walls remember this wish and say a prayer for him whose works we trust do follow him’. With the closure of the convent the little chapel now stands derelict and is waiting to be restored by the Historic Chapels Trust. The chapel at Salmestone Grange, in Kent, is another example of a medieval church disposed of by the Catholic Church. The property was acquired during the 1930’s by the monks of St Augustine’s Abbey at Ramsgate and has been described as one of the best-preserved and most interesting examples of monastic granges in Europe, having been used as a rural retreat by the Abbot and monks of St Augustine’s Abbey in Canterbury. Today it is set in beautiful, tranquil surroundings to the west of Margate. The chapel itself was consecrated in 1326 and then fully restored in the 1950’s. In recent years it was alienated from the Abbey at Ramsgate and its chapel is now used as a non-denominational location for marriage ceremonies. coursed flints. The building was restored in 1905/6 but not a single dressed stone has remained. Sadly this fascinating little building was disposed of by the Catholic Church in 1992 and is now maintained as a private chapel used for all sorts of different kinds of religious worship. My list has not ended. The oldest centre of Catholic worship in the north of England was sold in about 1990 having been leased to the Catholic Church for many years by the Forestry Commission at an annual rate of £2 (twice what we pay the Anglican Diocese of Bristol for St Mary’s, Cricklade!) This tiny chapel, situated in a medieval Northumberland pele tower, had served as a chapel to the Catholic Family of Selby who settled at Biddlestone, near Alwinton, in 1272. Now an isolated building, the Biddlestone chapel once adjoined Biddlestone Hall, the demolished home of the Selbys. In about 1820, when the family was rebuilding Biddlestone Hall, they repaired the remains of the tower and constructed the upper chapel over its undercroft. This meant that this former place of Catholic worship was erected on what is probably a fourteenth century tower basement. The Catholic Church declined the opportunity to purchase the chapel from the Forestry Commission “because there are very few Catholics in this area”. Fortunately since 1997 it has been vested in the Historic Churches Trust so it is still accessible to the public. On a much happier note there is a number of medieval churches which are cherished as Catholic places of worship. The ancient chapel of the Blessed Trinity at Stonor has been used continuously for Mass since 1349. The chapel of St Amand at East Hendred has had a similar history. St Leonard’s Chapel at Hazlewood Castle, in the West Riding of Yorkshire, was built in 1286 to replace an earlier one and Catholic worship has been carried on here virtually unbroken for nine hundred years. In 1970 the twelfth century Chapel of St John, in the Keep of Berkeley Castle, was re-opened by Major John Berkeley for Sunday Mass. St Peter’s Abbey in Gloucester. When the Abbey was surrendered to the king the grange at Prinknash passed into private hands and by 1628 the chapel was described as being in a ruinous condition, a part of the wall having fallen down. The chapel was eventually restored by Sir John Bridgeman who, in 1629, had it consecrated by the Bishop of Gloucester. This was to be of interest three hundred years later when the Benedictine community from Caldey Island arrived to take possession of the Prinknash property. Could a Roman Catholic religious community use a chapel which had been consecrated for Anglican worship? The situation was resolved and the beautiful chapel, with its sixteenth century glass depicting the nine choirs of angels, has been used by the community ever since. Another medieval church belonging to a religious community is at Hengrave Hall in Suffolk. From the seventeenth century until 1887 members of the Catholic Family of Gage owned the property. A few yards from the house is the ancient church with its curious round Saxon tower. This little church was built towards the end of the fourteenth century, though there are traces of an older Saxon church, which is mentioned in the Domesday Book. Having been altered and restored sometime before 1540 a Lady Chapel was added to the building. In 1589 it ceased to be a parish church and instead became a family mausoleum. In more recent years the old church served as a private chapel until 1952 when Hengrave became the property of the Assumption nuns who brought their boarding school for girls, from Kensington Square. The community and pupils then used the Church for worship until the school was closed in 1974. Today it is known as the Church of Reconciliation and services of all denominations are held there as well as the common worship of the Hengrave Ecumenical Retreat and Conference Centre. Within the Hall there is also an Oratory which contains a window of early sixteenth century glass with 21 lights of Biblical scenes, perhaps almost as perfect an example of the period as can be found in the country. to return Blackfriars in Gloucester to the Dominican Order and Greyfriars in the same city to the Franciscans but nothing has yet come of either proposal. Three interesting sites that have been acquired by Catholic religious orders are the Old Palace at Mayfield, in Sussex, New Hall in Essex and Buckden Towers in Huntingdon. Before the reign of Henry VIII Mayfield was the residence of the Archbishops of Canterbury. Archbishop Reynolds built the great hall about 1325 although Archbishop Islip (1356-1366) built the greater part of the then palace and enlarged the great hall. Seventeen Archbishops are known to have visited the palace from 1274-1530. After the Reformation the house passed out of church hands and in 1740 the great hall of the old palace was dismantled and fell largely into ruins. In 1863 a group of children from the convent school at St Leonards, founded by Cornelia Connelly, came for a picnic among the ruins. Later the site was given to her order, the Society of the Holy Child Jesus and the Old Palace was rebuilt as a school. By July 21st 1865 the work was completed and Mass was celebrated in the great hall which had become the school chapel. Another ancient palace now owned by a religious order is the former Tudor Royal Palace of New Hall near Chelmsford where the Canonesses of the Holy Sepulchre have run for over 350 years what is the oldest independent Catholic girls’ school in England. Since 1957 the Claretian Missionaries have also occupied Buckden Towers, the medieval residence of the Bishops of Lincoln. During the nineteenth century the Catholic Church of St James in Reading was built within the ruins of the former Benedictine Abbey and the Church of St Mary was built by the Weld Family in the grounds of the former Cistercian Abbey at Bindon in Dorset. erected a shrine of Our Lady. Eventually a new sacristy and a second chapel were provided and the whole complex was consecrated by Bishop Youens on 8th September 1938. The origin of the chapel is unknown. It belongs to the elaborate late decorated period of architecture, with a suggestion of the Perpendicular, and since the Decorated style persisted in East Anglia after it had been abandoned elsewhere, we cannot date it earlier than 1380. It is quite small measuring only 28 feet 6 inches by 12 feet 5 inches and after the Dissolution it was a cottage for many years. Abbey, an attempt was made to purchase it for the Catholic Church but the bid was unsuccessful. Two other ancient sites which have been acquired and where churches have been built amid ancient ruins include St Branoc’s at Braunton in North Devon and the Passionist Retreat of St Non which is situated on the cliffs near to St David’s. In the context of the Dode Chapel I spoke of a clutch of medieval Catholic Churches in Kent. These include the Chapel of St Katherine at Shorne near Gravesend; and St Mary’s Denton. St Katherine’s Chapel is a fourteenth century flint chapel banded with stone on the north side. It was nearly doubled in length during the fifteenth century but, as a chantry chapel, it was suppressed in 1545 by King Edward VI. For three hundred years it served as a malthouse before George Arnold purchased it in 1897 and restored it. The chapel now has a nineteenth century tiled roof and gabled ends but inside there is a double sedilia and piscina. Like Bartestree, it has served as a convent chapel. St Mary’s Church at Denton was originally the parish church of Denton before the fourteenth century and then, having fallen into ruins at the time of the Reformation, it was rescued and rebuilt in 1901. It was opened as a Catholic Church in 1940. It is built of flints with a tiled roof and much of the nave and chancel are twelfth century although little medieval work is actually visible from the outside. place of pilgrimage where Mass is celebrated every Saturday morning. Finally there is a number of medieval churches that have passed into the hands of the Catholic Church having been declared redundant by the Church of England. One of the best known is the Church of St Leonard at Malton, Yorkshire, dubbed ‘The Crown of Ryedale’. It was originally established as a chapel of ease for the nearby Gilbertine Monastery but became an Anglican Church from the time of the Reformation until 1966, when it was decided to discontinue services there because of the rising cost of maintaining a church badly in need of restoration and repair. A notice on a blackboard was placed in the porch of the church. It read as follows: “This church is no longer in use, but please pray that it may have a future worthy of its great past”. Five years later it was legally transferred to the Catholic Diocese of Middlesbrough as a completely free ecumenical gift. Today St Leonard’s and St Mary’s is an active Catholic Parish Church. Rather like at our own St Mary’s Church in Cricklade, costly restoration work has been undertaken. During the winter of 1984 the spire was struck by lightening and the resulting damage necessitated the replacement of the whole structure – a task that brought with it a substantial debt to the parish. A post-renewal survey subsequently revealed the fact that remedial work to the tower was both urgent and essential. The work of re-facing the tower upwards of the belfry was carried out during 1988/9 at a cost of £50,000. This was added to the previous outstanding sum and brought the debt for refurbishment to a staggering £88,000. Further to this, during 1989/90 the interior of the church was re-ordered, new lighting was installed; the heating system was converted from oil to gas, and a specially designed wrought iron screen was fitted to delineate the Blessed Sacrament Chapel. In more recent years a presbytery and parish centre have been erected in the immediate environs of the church. Abbey. Church House, which adjoins the north aisle of the church, may well have its origins in the dormitory of the original twelfth century priory. The church was fully restored in the early 1990’s by the Little Brothers of Nazareth and it has become a centre of Eucharistic Adoration and, within the grounds of the church, Walsingham House has been erected to provide a ministry to men and women who are chemically dependent. Langport in Somerset is an example of a redundant medieval church being generously offered by an Anglican diocese but not accepted. In addition to the above there are now numerous medieval Anglican Churches that are being used regularly for the celebration of Mass. In Clifton Diocese these include Bruton, Bishop’s Cleeve, Highworh, West Harptree, Bishop’s Lydiard and many others. It is very heartening that Catholics and Anglicans can share their joint heritage in this way and organizations such as the Wiltshire Historic Churches Trust help us to share the joys and burdens of maintaining this rich heritage for future generations. Clifton Diocesan Directory 1994, Mersey Mirror Ltd., 1993 - At the Heart of the City –Prayer, Peace and Compassion page 130,131.